You are here: Home » What’s for Dinner? Tomatoes. I wait all year for Barbara’s tomatoes. I refuse to buy the imported, tasteless, watery tomatoes sold in the grocery store. Occasionally during the winter I buy canned San Marzano tomatoes to make sauce, but nothing compares to the sun-ripened tomatoes that come out of our garden. 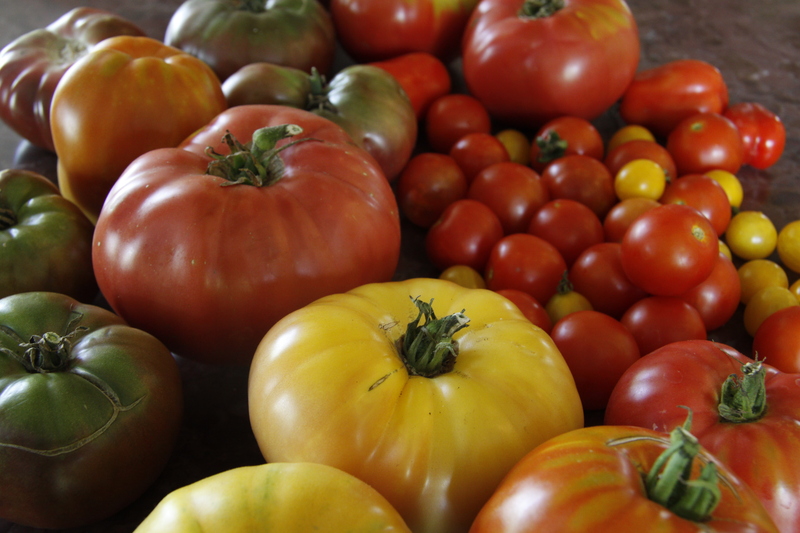 We grow three kinds of cherry tomatoes, ranging from almost black to yellow, 2 varieties of yellow heirloom tomatoes and three of red, 2 kinds of paste tomatoes, and Sicilian heart-shaped tomatoes. This year our tomatoes are out of control. When we went to the Addison County Field Days earlier this week, we didn’t see anything in the vegetable competition that even came close to our monsters. In June I kept saying to Barbara how I couldn’t wait for her tomatoes to ripen, now I complain that we have too many tomatoes. For the first few days we simply sliced the tomatoes and garnished them with basil, salt and olive oil. Other favorite tomato dishes include gazpacho, caprese salad with mozzarella di bufala, bruschetta, amatriciana or arrabbiata sauce for pasta, and a roasted cherry tomato pasta sauce. We also roast and stuff them with rice, couscous or cheese, or slow roast and preserve them in oil for the winter (we would sun dry them if we could, but unfortunately here the sun isn’t strong enough and it’s far too humid). The Flavor Bible cites basil, bell peppers, cheese, garlic, lemon, olive oil, onions, salt, pepper, thyme and vinegar as the best matches for the tomato. Some of our other favorite parings include hot peppers, sausage, pancetta, prosciutto, and potatoes. 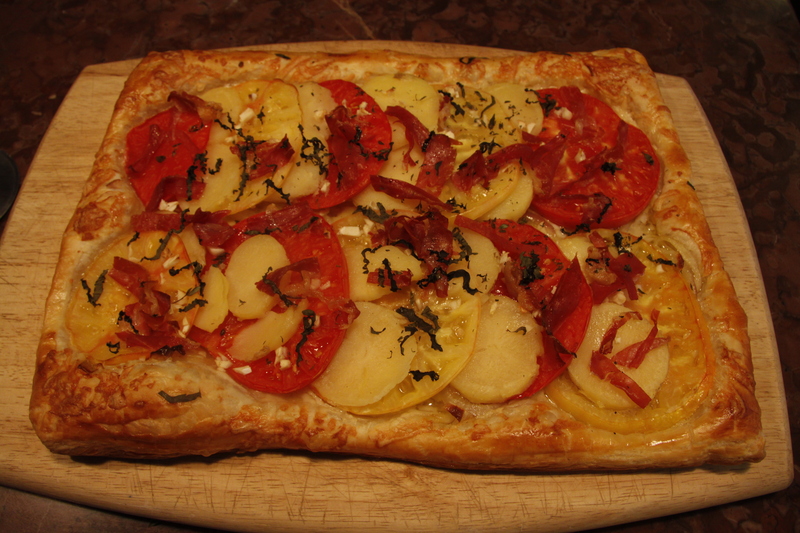 Last night we decided to get creative and came up with a new delicious way to use our tomatoes in the form of a flaky tomato, potato and prosciutto tart. We’re always in search of new recipes, though, for our fresh tomatoes — what are your favorites? 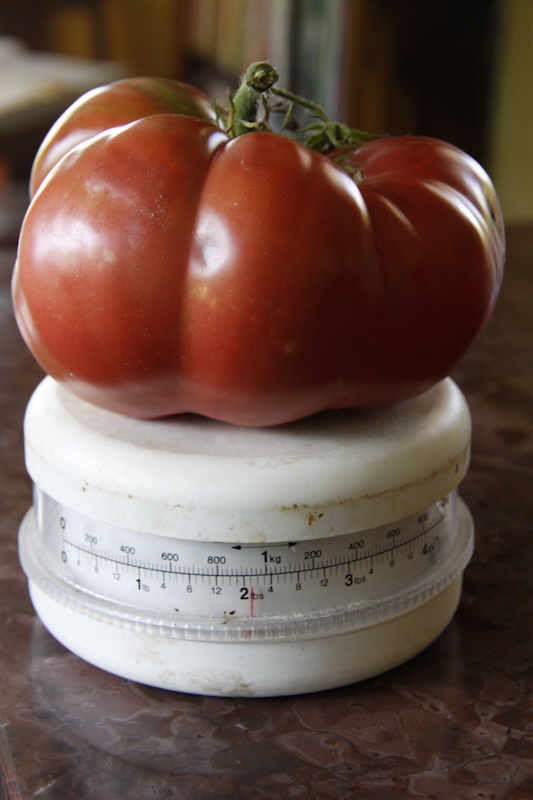 Michaela and I bought a few gorgous Heirloom tomatoes in our local Newton farmer’s market on Tuesday. The young woman who hand picked them for us told us her grandmother always served them sprinkled with brown sugar. So we tried it and it was great. Like feta and watermelon; or canteloup and prosciutto. Sorry for the rain on Sunday and missing a great lunch with Alex. How interesting — I’ve never heard of that before! We’ll have to try it, thanks for the tip! 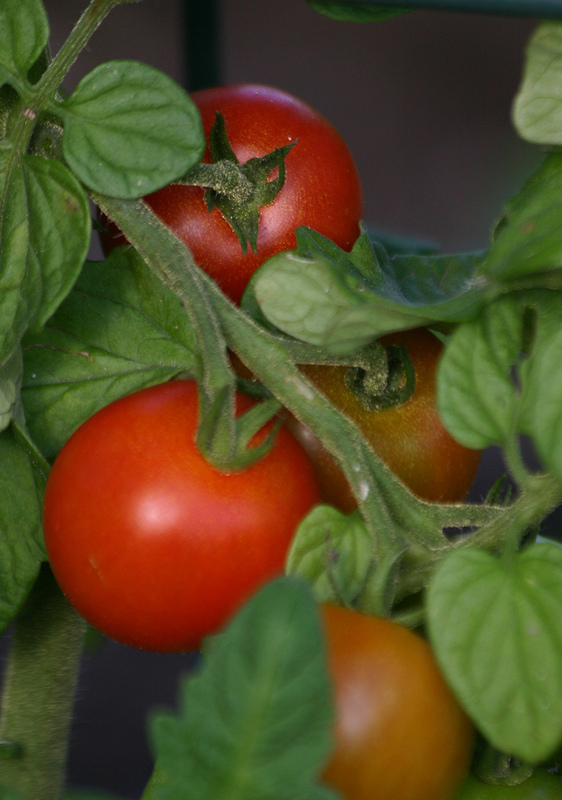 We are FINALLY getting ripening cherry tomatoes after our cool summer. I confess I’ve been buying organic grape tomatoes from Whole Paycheck when they go on sale and I slow roast them in the oven with olive oil, S&P then freeze for “winter sunshine.” I splurge on heirlooms at the farmers market sparingly (at 4-6 dollars per lb). Nancy, I agree — slow roasting not-so-ripe tomatoes is the way to go! The recipe I link to from Lidia Bastianich uses this technique to create a delicious pasta topping that works equally well in the winter! I am so far unable to find the conte cheese. Can you tell me what would be comparable. I like to follow a new recipe exactly the first few times I make it. I will then experiment with the recipe. Perhaps you can’t find the cheese because I misspelled it — oops! It’s comté. If you’re still unable to find it, you can substitute with Italian fontina or a mix of Italian parmigiano or pecorino, or you could try any hard sheep cheese of your liking, or an alpine cheese. I hope this helps and let us know how it comes out!